The Pacific is home to an extraordinary and diverse number of oceanic islands, from Palau and the Marianas east of the Philippines to Cocos Island and the Galapagos west of the Americas. The isolation of these lands and extreme distances between them long prevented scientists from studying their flora and fauna in a comparative context. Here, George R. Zug offers the first such systematic overview in more than half a century. Aids in the identification of each species along with details of their form and coloration, habitat and distribution, reproductive biology and natural history. Colour plates of more than 75 percent of the species also help to facilitate visual identification. This accessible and informative guide is the most comprehensive field reference available and will appeal to both novice sightseers and professional naturalists. Pensoft Series Faunistica 57. 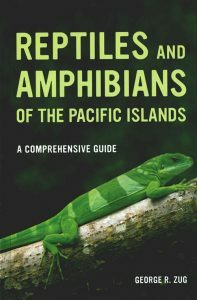 This book provides comprehensive accounts of 85 reptiles, which represent all the currently known species occurring in this island archipelago. Most importantly, the natural histories of the living animals are given in detail, and almost all species – including many colour variants – are depicted in large, full-colour photographs. 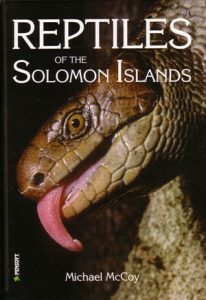 While Reptiles of the Solomon Islands is essentially a field guide, it is compiled in such a way as to be of use not only for professional biologists working in the field or museum, but also for the interest of amateur naturalists and travellers in Solomon Islands. In fact anyone with an appreciation for the natural history of this group of beautiful South Pacific islands will find this book a worthwhile addition to their library.Keys and species descriptions, bibliography, indexes. In English. This is a book about the frogs of the New Guinea region, where they came from, how they live and why there are so many of them. It is not, primarily, a systematic treatise and the descriptions are necessarily brief because providing a complete detailed description and diagnosis for all 300 species would make a very bulky volume. For those who need more detail, a reference to the original description of each species, or to a recent revision of the taxon, is included. 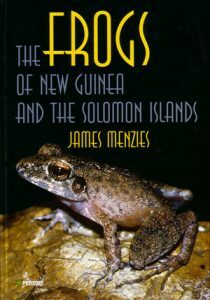 The primary purpose of this book is to assemble all that is recorded in the literature about New Guinea’s frogs together with the author’s accumulated data from twenty-five years of residence and research in Papua New Guinea.